Rosette leaves 3–5, scattered on the basal part of the stem, oblong to elliptic, 2–7 cm long. Flowers 8–20 mm wide, margins entire; sessile. Scape to 15 cm high; stem smooth. Flower c. 3 cm long, green and white, erect. Apex of galea decurved. Dorsal sepal subacute to obtuse. 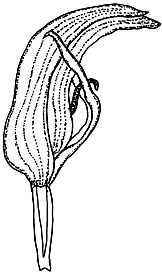 Lateral sepals loosely embracing the galea leaving a lateral gap; sinus deeply V-shaped when viewed from the front, protruding in a shallow curve when viewed from the side; free points linear-tapered, c. 15 mm long, recurved. Petals broad, subacute. Labellum ovate to lanceolate, 14–16 mm long, c. 4 mm wide, dark blue-green, subacute, apex often curled, distal third protruding from the sinus in the set position. Distribution and occurrence: Grows in wet situations such as seepage areas or near streams in montane forests and subalpine shrubland; south from Brindabella Ra.